U.S. magician Wayne Houchin is recovering in a Dominican Republic hospital after a TV host lit his head on fire with a flammable liquid. Houchin was a guest on the Dominican Republic's "Approach the Stars" TV program Nov. 26 when, he says, host Franklin Barazarte unexpectedly poured flammable cologne on his head. 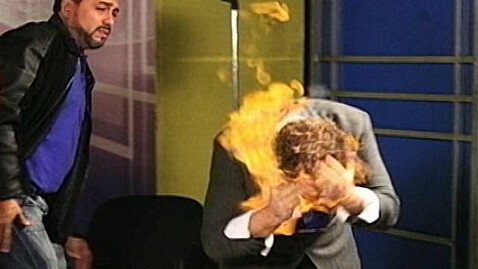 A video of the incident shows the magician's head bursting into flames as Barazarte runs his hands over Houchin's hair. A warrant has been issued for Barazarte's arrest. Houchin was rushed to the hospital with first- and second-degree burns to his face and hands. He wrote on Facebook, "This was not a stunt or part of an act. This was a criminal attack." In an e-mail to ABC News, he said: "The doctors here are cautiously optimistic that I will heal with no scars on my face. Each day I look and feel better. My hand, however, is in a lot of pain and isn't healing as well as my face." Even world-famous magician David Copperfield has come out in support of Houchin. "You try to present yourself as a performer that is creating wonder and amazement and occasionally somebody might misunderstand that and might think that you're trying to foster belief in something supernatural," Copperfield told ABC News Sunday night. Houchin was performing on the show with a group of magicians. After the performances, Houchin says, the host told them he wanted to give them a "blessing." Without warning, Houchin said, the host doused him with "Agua de Florida," a flammable cologne commonly used in Santeria rituals. The video shows Barazarte and others trying to extinguish the flames for a few seconds as Houchin lay on the floor covering his face. Someone in the video can be heard saying, "His face is burnt." It is unclear what ignited the cologne. The incident was not broadcast on Dominican television, according to The Associated Press. The show has not responded to ABC News' request for comment. Houchin has gained international success as a magician. He has appeared on Discovery's "Breaking Magic." Houchin and his wife earlier this year broke the world magic record for the fastest upside-down, dual strait-jacket escape.